If you want to go running in Gran Canaria's Playa del Ingles, you have basically two choices: run southwards along the beach past the gigantic dune towards Maspalomas lighthouse, or run along the beach in the other direction (northwards) towards San Agustin. And since the dune is a fairly obvious choice (lots of nature, no buildings and just the sound of the wind and waves), I think you would come up with that idea yourself. Go run it! 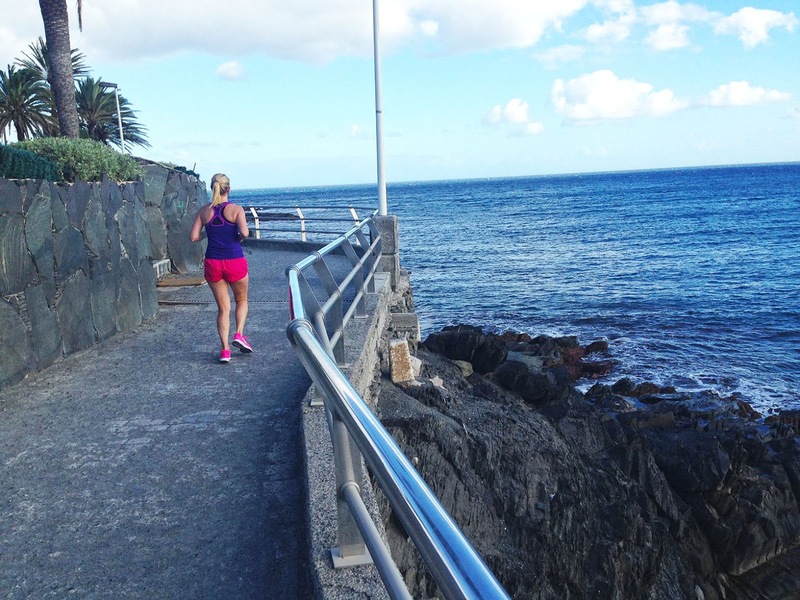 But many people don't know how nice it also gets along the cliffs of San Agustin, so this run will introduce you to the area northwards. 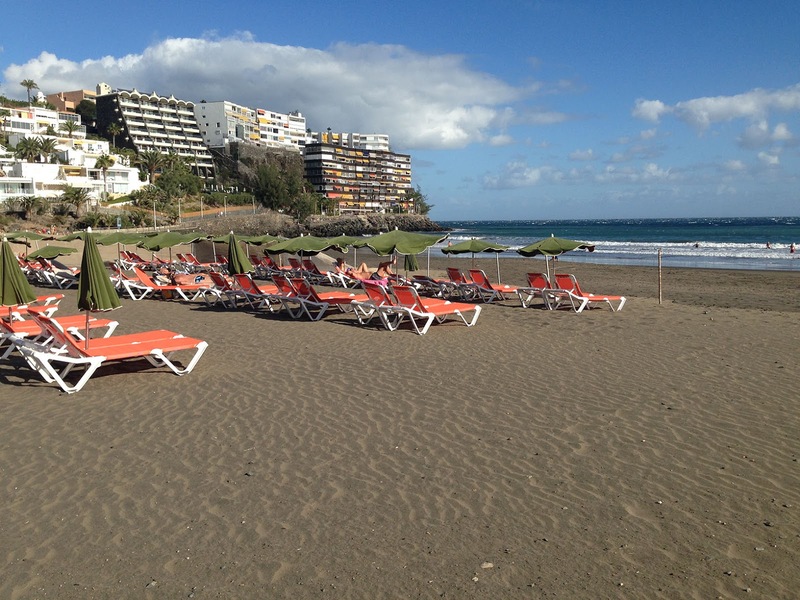 Both runs let you get out of the packed tourist sardine-can that is Playa del Ingles and view the wide horizons over the Atlantic. So, if you're ready, let's go explore the cliffs! Get yourself to the starting-point, at the corner of Calle de las Dunas and Avenida Alféreces Provisionales (that's the squiggly street that heads downhill from the center of town, down towards the beach, kind of Playa del Ingles' version of San Francisco's Lombard Street, without the flowers). Standing at the traffic circle, you'll see the Ciao Ciao ice cream parlor, across from the giant Dunamar Hotel. So head past Ciao Ciao through the open square to the beach. The dune begins just to your right (remember, that's your other big route). But now, on the sand, just turn left and start heading north, with the water on your right side. 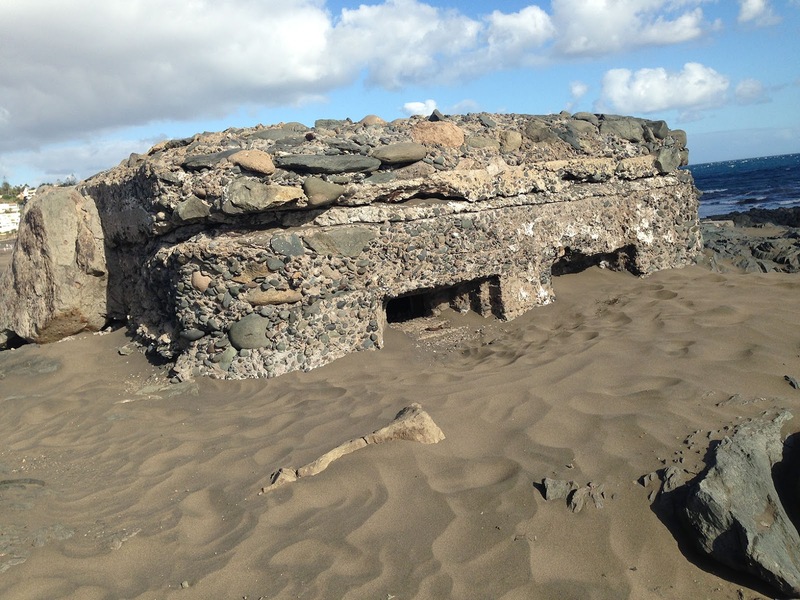 After a few buildings, you will soon be running below a sand cliff, along the Bahía del Inglés. After the cliffs start sloping slowly down to the shore, the beach becomes very rocky for about 400 meters, beginning at the Beverly Park Hotel. But, luckily, the pedestrian promenade also descends from the bluffs here. 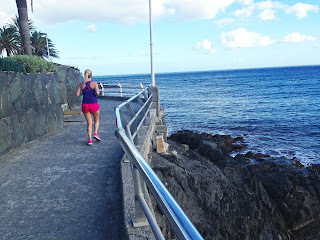 So you have a choice of either running along the paved promenade or running along the flatter parts of the rocky beach. Sand beach soon returns after the next stone jetty. This is San Agustin's first little beach. So now, at every stretch of beach, you have a choice: stay on the promenade or run on the sand. I personally prefer running along the packed sand near the water's edge, closer to nature and the sound of the waves. Just ahead, you'll see a natural stone jetty sticking out into the Atlantic crowned with some fishing boats, adding one of the few local touches to this tourist area. The beach ends at the Don Gregory Hotel, and my favorite stretch begins: the pedestrian promenade rises above rocky cliffs, tracing the zig-zag shoreline for the next 700 meters, with nice bungalows lining the way. So enjoy this part of the run! 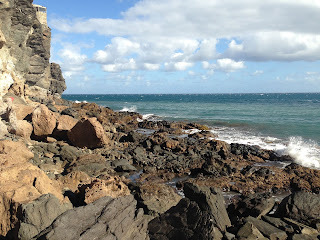 The San Agustin cliffs: nice spot! The second beach in San Agustin begins at about the 3-km mark and stretches for another 600 meters, another chance to run along the water's edge. 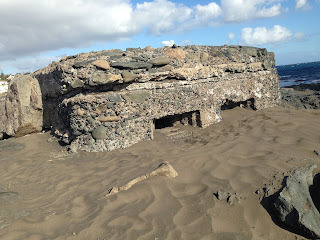 It begins with an old cement bunker right on the beach. At the north end of the beach, you'll have to go up to the next pedestrian shore promenade at the foot of the buildings lining the huge cliffs, called San Agustin Balcón. The buildings line the cliff-face from the sea way up to the bluffs, 9 floors above. The promenade then ends in nothing but rocks after the last apartment building. End of the trail here! Time to turn around and head back home the same way that you came! 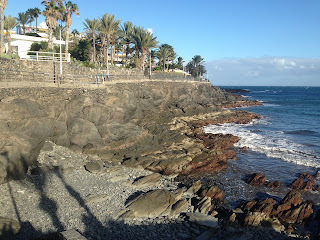 NOTE: If you want to continue northwards, you can take the 9-storeys of steps that rise between the two balcon apartment buildings, then continue northwards along the street above, then take the steps back down (below Manni's bar) to the next beach, Aguila Playa. This is a cool little beach beneath shorter cliffs, with a walkway above for a few more blocks. This running route was very nice, thanks!